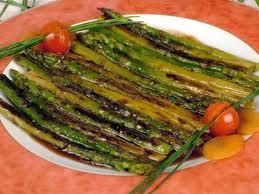 Prepare a good grilled on the barbecue and asparagus do about it. When they are browned on the outside and showing, when pressed lightly, already they tender on the inside, remove and put in a bowl, covering them to slowly lose heat. After mixing the contents of the two tins of anchovies, including its oil, with additional oil and make a fine paste with the rod or mortar. Serve the asparagus; They will open, stripping them of their toast wrapped, each diner their own, aliñándolos, steaming and aromatic, with a little sauce of anchovies. To taste them so full, accompanied only bottled water for drinking.